Custom quilts are made to order. You pick the colors, size, theme and together we draft a design for the quilt. These can be bed covers, wall hangings, baby quilts, lap quilts, or table runners and placemats. Some popular sizes are below, but you will want to measure your bed for exact size. Fill in the box on this page and email it to us. We'll call you or email you to go over the details, then give you a FREE quote. Baby Quilts 36" x 54" Double 72" x 90"
Lap Throws 54" x 72" Queen 90' x 108"
Twin 54" x 90" King 108" x 108"
Wall Hangings can be any size 8" x 12" to mural size. Tablerunners vary, based on your table size; placemats are 12" x 18"
Pricing is based on the type of quilting you want for your pieced quilt top and is based on cost per square inch. See the box below on how to calculate the size of your quilt. This is simple overall quilting of the top, includng borders, edge to edge with no frills. This includes custom quiltng such as feathers, stippling, heavy quilting, deluxe borders and custom outline or block designs. Measure length and width of the quilt edge to edge. Multiply the length inches x width inches = square inches. Then multiply th square inches x the rate to obtain your base price for quilting. 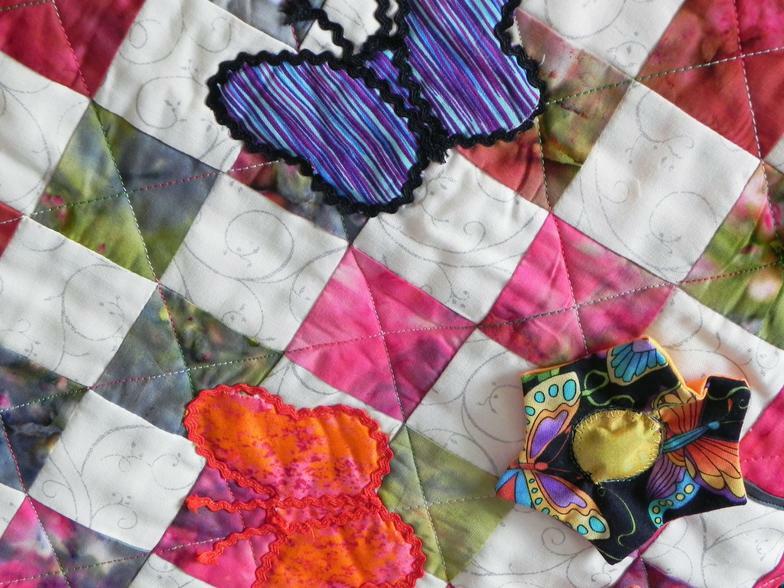 Memory quilts are made-to-order and are often used as gifts for weddings, birthdays, anniversaries, graduation, Mother's Day etc. They can include photos, clothing items, laces, charms, T-shirts, ribbons, and other memorabilia. They can be made into pillows, wallhangings, lap quilts or bed quilts or they can be framed as art. I prefer to have a face-to-face, phone or skype consultation with you before giving you a quote for your special quilt. Prices range from $200 to $1500 for this type of custom item. Please use the form on this page or the products page to send me your request or questions about custom items. Quilted Cards are available for all occasions. A custom card can be made to match your custom order. Standard size is 4"x6" and includes a mailing envelop. Custom sizes are available. 1-2 week delivery. Prices range from $8.50 to $25 per card. Want to see more or purchase ready-made items? Visit our Etsy shop at: www.Etsy.com/shop/Quiltnutz.